Efremidis Gallery is proud to present ‘Hanged Man’, a solo exhibition by Jinkyun Ahn. Jinkyun Ahn continues his tradition of working with and within the concept of the generational family legacy with his 2016 series ‘Hanged Man’ shown here. His parents have played a central role in his earlier photographic work such as the serie ‘Dance Dance Dance’ from 2006 and ‘Encave’ from 2010. In ‘Hanged Man’ Ahn takes center stage while simultaneously letting the next generation, his son, infiltrate the image. The ‘Hanged Man’ series consists of 12 photographs, eight of these are on view here. 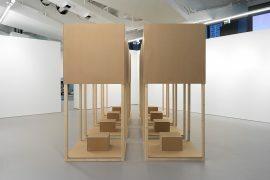 The images feature the artist himself in what appear to be absurd positions, a closer look reveals that the images are upside down, making the central figure, Jinkyun Ahn, appear to be hanging. We have found our titular hanged man. The vertical reversion of the image recalls the basic principles of the camera and photography. In essence, Ahn is showing the viewer the image the camera sees, not a representation of reality. 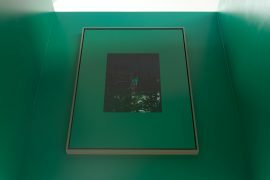 While reflecting a more accurate reality of the camera’s viewpoint, Ahn simultaneously sees these images which show his acts of ‘photographic suicides’ as unreal and impotent. They are pretend play without power, thus taking away the absolute power of the camera’s gaze and caricaturing his own patriarchal authority. 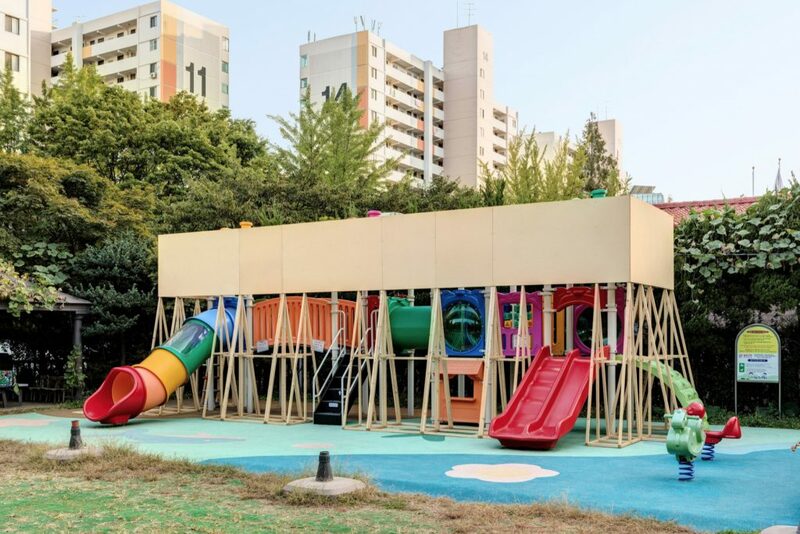 The photographs are taken by the artist’s wife in different playgrounds in their neighborhood in Seoul, South Korea. 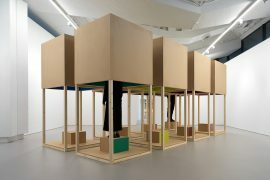 At times his young son enters the scene, unaware of his father’s artistic intentions, and attempts to engage his parent and inadvertently becomes part of the image. The ‘Hanged Man’-series was originally shown in Seoul in a local playground. 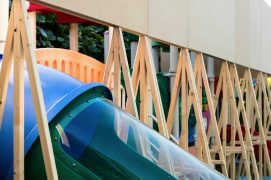 A wooden structure was erected around the playground equipment. 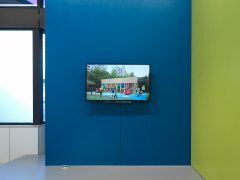 The viewer had to engage with the playground devices in order to see the work. 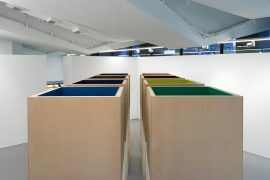 At Efremidis Gallery, Ahn has chosen to show the photographs in eight individual wooden structures. 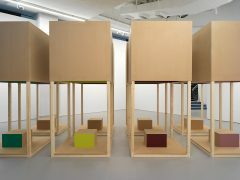 The image is hidden to the outside viewer and can only be seen after entering the structure and stepping on the wooden box. A hint to what may be viewed can be found on the side of the wooden stepping box. 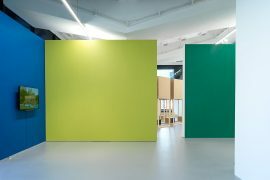 The side of each box is painted a different colour which corresponds to a colour from the photograph shown in that particular structure. 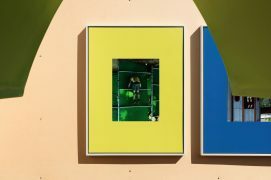 These very same colours frame the photographs visually creating a playful variation on the more traditional harsher white passe-partout. 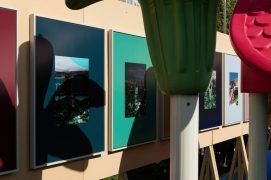 Ahn is known for creating amusing and engaging installations to show his photographs on or in. 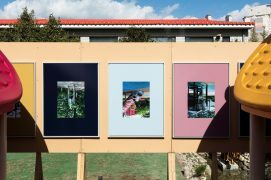 These installative elements in his work are part of the diverse formal exploration he pursues and are meant to lead the viewer to ponder questions regarding the dominance of the photographer in relations to the subject, the power struggle between the gaze of the lens and the subjects’ pupil.